August 1, 2014 by Ecommerce News. About Mobile, Statistics with tags Italy. 737 views. Redesigning the site have proved to be effective for Yoox Group, as it saw an 18% increase in conversions and a 3% lower bounce rate than the old site just weeks after launch. And to top it all off, the Italian online retailer that also operates ecommerce sites for other brands, reported 15% revenue growth in the first half of this year. The new website, launched on 10 July on both desktop and mobile, makes site navigation and the path to purchase simpler and faster, Yoox says. “With the ultimate aim of improving the conversion rate.” And thas has happened, as the ecommerce retailer saw an 18% in conversions. Its total net revenue in the first half year of 2014 rose nearly 14.8% year over year to 230,8 million euros, compared with 207,4 million euros in the same period last year. The redesign was also meant to emphasize new categories and to magnify the visibility of various aspects of the website, such as “Pop Up Stores”, that feature specific brands. The site search was also improved, with the introduction of tailored research attributes, such as face shape, material and lens options. MYOOX, a part of the website dedictated to registered users, also got a redesign, based on customer feedback. There’s no better social media intergration, personalised content and more information on the status of orders and returns. According to Yoox this has reduced contacts to customer service. Yoox also invested heavily in the mobile channel, which is growing steadily, month after month, hitting new all-time highs. Last month, the company launched a global partnership with WeChat, so users will now be able to chat in real time with Yoox’ customer care and personal style advisors. For now, this features are only launched on Yoox.com in the United States, Italy and China, but will later be extended to other online store of the Yoox Group. New apps for iOS and Android are also being developed and will be released before Christmas this year. 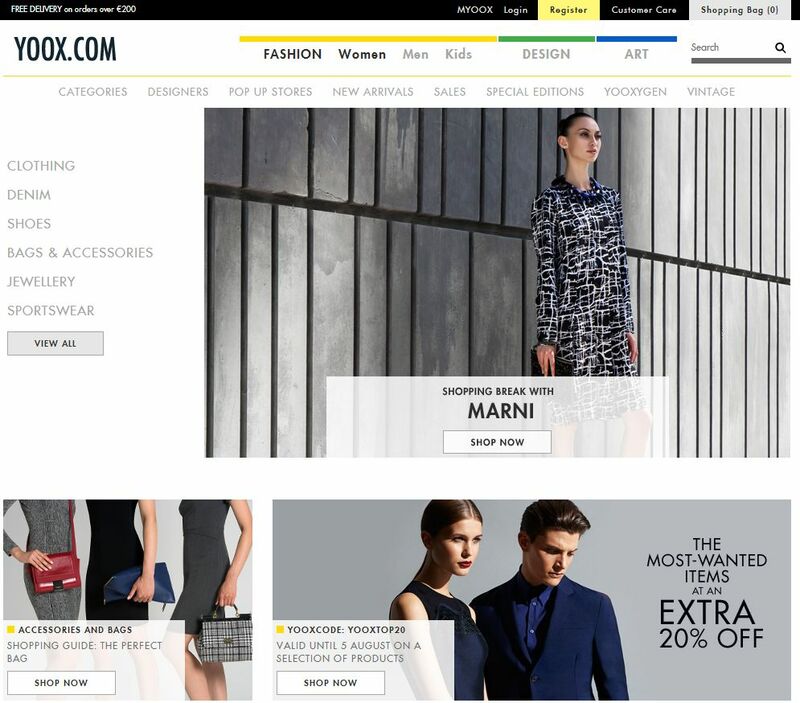 Yoox Group is an online fashion retailer, but also a global ecommerce partner for leading fashion and design brands. The company owns multi-brand online stores Yoox.com, Thecorner.com and Shoescribe.com, but also set up and manage luxury retail sites for brands like Yves Saint Laurent, Alexander McQueen, Balenciaga, Bottega Veneta and Sergio Rossi.